My grandfather, Christian Peter Birkholm (1877-1954), wanted to go to sea as his father, uncle and great grandfather had done, but his health was precarious and his mother insisted that he stay on shore. So instead of working in healthy salt air he served a four year apprenticeship as a spinner and weaver in Fåborg and was subjected to the lint and dust of small textile factories. Having finished his apprenticeship he travelled in Germany for several months, taking work as a journeyman wherever he could find it. Eventually he joined his relatives in Thisted and found a job there. Christian did his work well and conscientiously and was a pleasant, kindly man. But he was easy-going, did not have much physical energy, and developed some health problems. It seemed that he never did find his niche. Perhaps if he had become a sailor or teacher or minister his health would have been better and his work more satisfying. Christian married Karen Povlsen in 1898. For a number of years the family moved around north-west Jutland, settling wherever Christian could find work; they never did own a home. From 1905 to 1911 he had steady employment in Thisted. But he joined a labour union and lost his job; apparently his employer could not afford to pay union wages. (Mother remembered him earning 12 Kr. per week – about $3.00.) Then for a number of years he had only casual employment. The family made several moves – to Hurup in 1914, then to Vestervig where he worked in a plant that produced tile and bricks; then to Ålestrup; back to Hurup in 1918; finally to Skive, also in 1918 – wherever work was to be had. Christian contracted tuberculosis while in Hurup and spent a year in hospital. On another occasion he nearly died of a ruptured appendix. The family knew poverty. 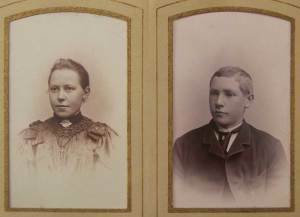 They were the “poor relations” when relatives were prospering; and when the grandparents from Fåborg visited in Thisted they stayed in Onkel Johan and Tante Cecilie’s large house rather than in my grandparents’ crowded quarters. At one time the Birkholm family shared one outdoor privy with three other families. They were sometimes dependent on charity, and Mother remembers being sent to a store to ask for an extension of credit – apparently neither of her parents felt they could do it; or perhaps they thought it would be harder to deny credit to a child than to an adult. They were desperate. Christian and Karen Birkholm and their 5 oldest children. 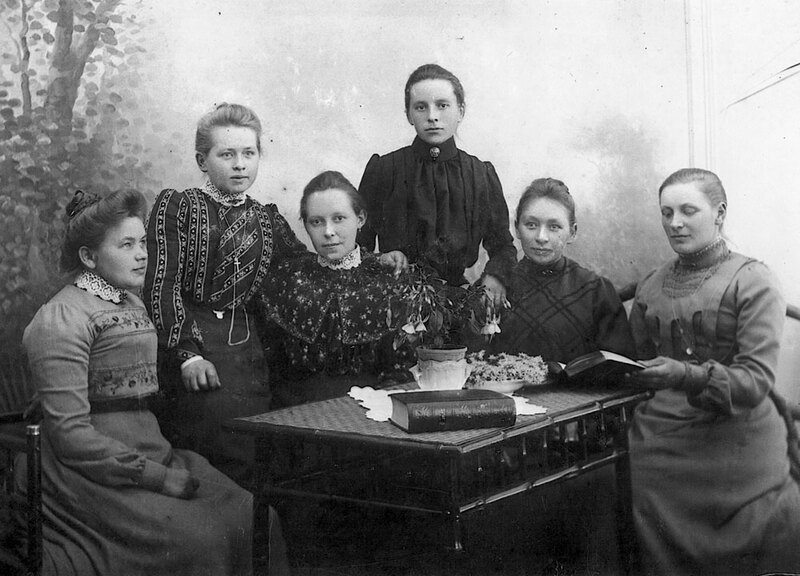 My mother Magda is seated in the middle. 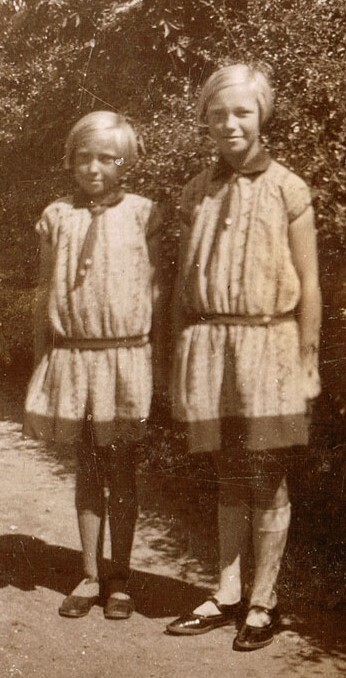 Grandmother supplemented the family income by sewing for the neighbours; like her mother she was an expert seamstress. She would sit up half the night making clothes for the children or for other families. She could make a dress or shirt without a pattern and even sewed a suit for Bedstefar. Then from 1922 to 1929 she worked in the hospital in Skive; it was a matter of night-watching rather than of nursing. She loved looking after people in need and found fulfillment at the hospital. Mor said dinner in the Birkholm household generally consisted of two courses, the first being a soup, gruel or øllebrød, the second usually meat or fish with potatoes. The meat was typically a cheap cut of pork, and Mother remembers her parents sitting up late at night picking the meat out of the backbone of a pig. Fish were purchased from the fishermen on the wharf. Each person was served just one frikadelle (meatball) at a meal. Cracked eggs and skim milk were cheap; they were used in making pancakes, etc. Buttermilk was also cheap. For supper ryebread was spread with rendered pork fat and sliced cheese, etc, and as an occasional treat, sugar, after the first three slices it was bread and pork fat only. (It was no wonder that their teeth decayed.) Breakfast consisted of coffee, milk and bread. In their early years my grandparents belonged to the Home Mission of the Lutheran Church. Around 1908 however an event occurred which caused them to seek a church home elsewhere. Their infant son (“the first Aksel”) died at six months without having been baptised, and some of their friends in the Home Mission were quite sure that he could not enter heaven. That was too much for Grandmother. She and Grandfather were certain that God’s love was great enough to compensate for such a small omission. They became Methodists and adherents of a kinder Gospel. There were occasional Methodist services in Thisted, but no organized congregation. 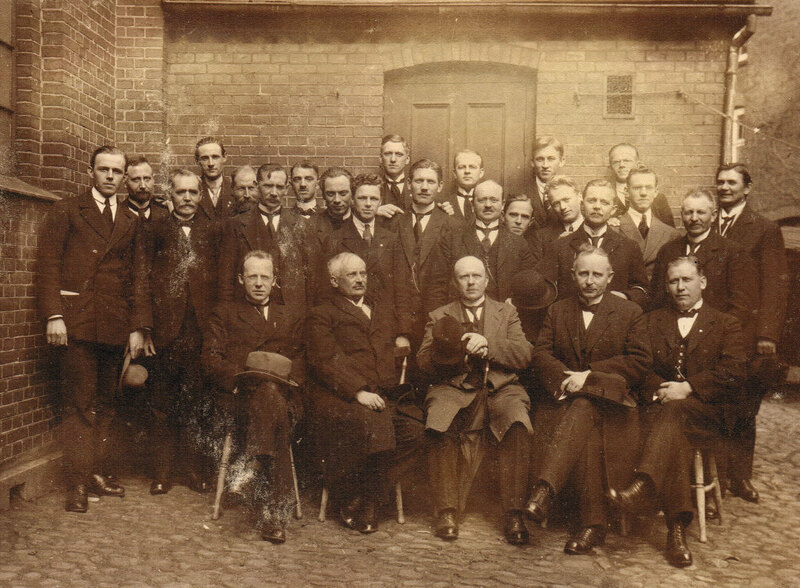 Soon after moving to Skive in 1918 they became the center of a small Methodist community. In 1920 the national Methodist church purchased a building containing a tavern and several small apartments. The tavern was converted into a chapel and my grandparents moved their family into one of the apartments. 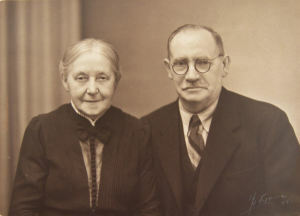 Grandfather became a licensed local preacher and the superintendent of the Sunday school, and led the services when the minister was unable to be present. We have pictures of him and Dad together at courses for lay preachers, along with a number of other men. “In Skive we have begun using our new property. We had our first service there on Sunday, January 14. Since that time we have had a reception of new members. The congregation was organized in the autumn with 21 persons in full membership, and now we have 28 with 2 on probation. On Monday, February 5 we started a children’s organization with 23 members, and more are expected to join. “Brother Holm” was my father, and “Brother Birkholm” my grandfather. 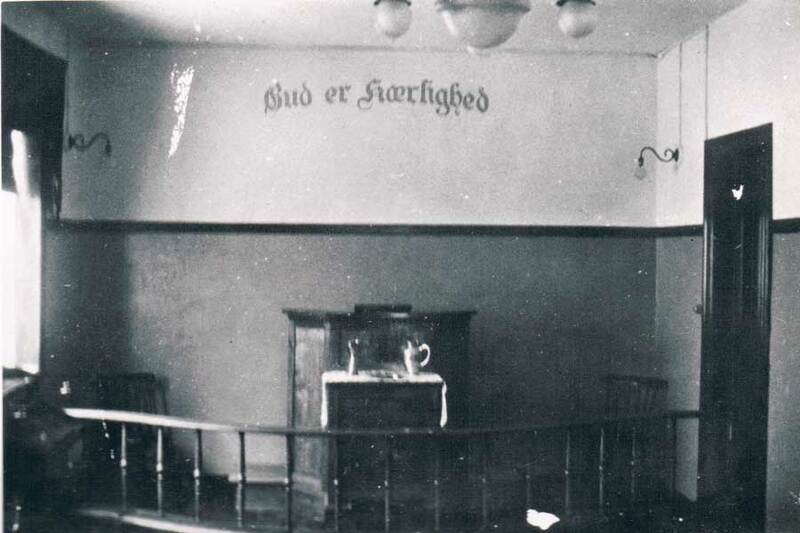 Methodist Folk School in Aarhus, 1920. My grandfather is sixth from left, my father is sixth from right. Grandfather was a great reader, and while living in Skive would often take his Bible or some other book into the chapel where he could read in peace. To the end of his life he read his Bible daily. He was also a good singer and although he could not read music would play the organ and harmonize. Members of the congregation would sometimes speak of going to church “to hear Birkholm sing”. That of course was in the days before radios became common. They also apparently appreciated his sermons. On Fridays Bedstemor always made a buttermilk soup which required constant stirring; that was the day the church’s weekly paper arrived, and she would catch up with the church news while stirring the soup. Otherwise she had little time for reading. 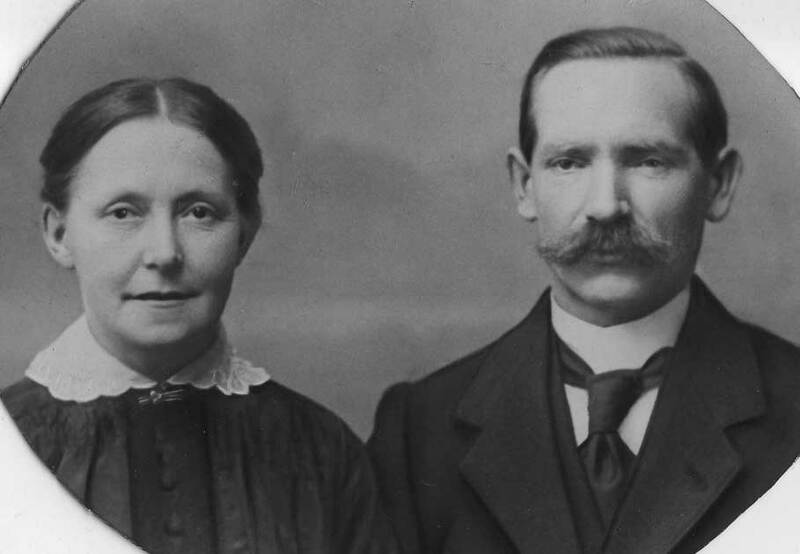 She worked long and hard, and the fact that the family was able to stay together despite unemployment and illness was largely due to her industry. Mother tells me however that as long as Bedstemor controlled the finances the family had continuous money problems. When she began to work fulltime at the hospital Bedstefar took over the money matters and they were better able to stay out of debt. Bedstemor wanted a style of living which by most standards was modest, but was still more than the family could afford. She was kind and generous but tended to be naive and trusting. While in Skive Bedstemor made the rounds of the stores once a year, soliciting donations of items for the congregation’s annual bazaar. Grandfather was more intellectual and a deeper thinker. He liked to help the children with their homework and taught them to make Christmas ornaments. Mother remembers going with him to see the Christmas displays, walking with him in the park, and bringing him his noon lunch and eating it with him there. He was much loved by his children – a quiet, tolerant and understanding man, a singer and humourist and story-teller. Bedstefar and his brothers were full of fun, and when they were together life was full of practical jokes and side-splitting laughter. When Onkel Ludvig Birkholm met Peter’s wife Anna, who was rather massive, he exclaimed, “You look just like a fullrigger!” Mother remembered Ludvig crawling under a table and pretending to be a bear. In his youth Bedstefar had worn a goatee. The story was told that for some time he had wanted to shave it off, but Bedstemor objected. One day however he shaved one side and left the other untouched. When Bedstemor saw his face she burst out laughing. “Ah Far dog!” (“Oh no Dad!”) she exclaimed. He explained that he was just taking her wishes into consideration along with his own and trying to effect a compromise. Then he shaved the rest of his face and from that time on wore only a mustache. In her old age Bedstemor suffered a number of small strokes, and her faculties deteriorated. After each stroke she would sleep for a day or two, then wake up and ask for coffee which Bedstefar would bring her. In those years he gave her breakfast in bed and generally pampered her. Once she tried to sew a dress for herself as she had done many times in the past, but put one sleeve on backward and was dreadfully embarrassed and hurt; he restored her good humour with a joke. Bedstemor was fortunate in her husband; her mother-in-law told her that she had got the best of her four sons. (2) Christian and Karen Birkholm had eight children. 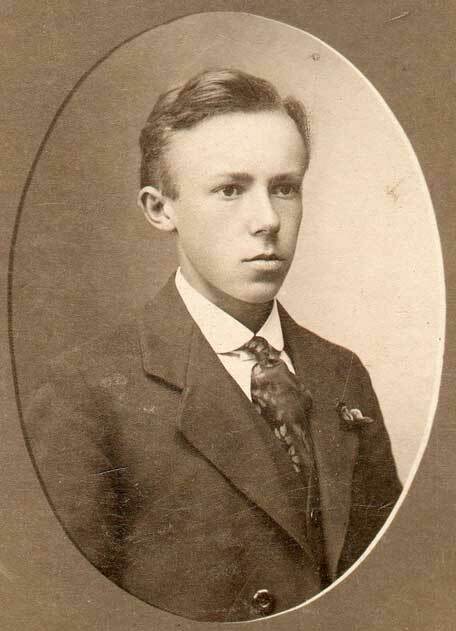 Peter was born in 1899. He was sickly as a boy, spending much time in bed, particularly in winter. When he was eleven or twelve tuberculosis kept him in bed for a year. He maintained good school marks however, good enough to entitle him to free education for three years beyond age 14 (mellemskole), and as the family at the time lived in Thisted where there was a mellemskole he was able to take advantage of the opportunity. Later he was apprenticed to Onkel Jørgen to learn the trade of glazier. But Tante Meta used him as a babysitter when he should have been working and learning, so he left that employment. Then he was apprenticed to a butcher and his work took him to farm homes where the fresh air and good country food improved his health and he became robust. 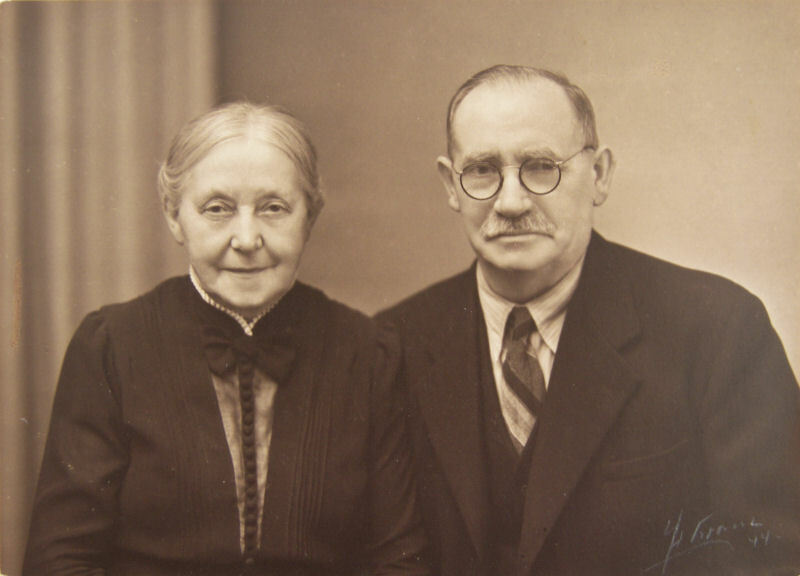 He married Anna Knudsen and for many years he and Tante Anna ran a butcher shop in Thisted; later they had a grocery store in Copenhagen. He died at the age of 79. In his youth he apparently had a tendency to alcohol abuse, and Mother more than once helped him to bed when he came home drunk, doing it quietly so their parents would not be aware of his condition. It was said that Tante Anna straightened him out, but after her death he reverted to the bottle. Peter and Anna had three sons. lb was a butcher, first in Thisted, then in Copenhagen and later back in Thisted. He died of lung cancer in 1981. I visited lb in 1980 and remember him as having much of the warm Birkholm personality. lb’s wife Emma told me that she had first come into their home as a servant, and was impressed by the fact that lb would not let her shine his shoes; he would do that job himself rather than ask anyone else to do it. They have a son and a daughter. 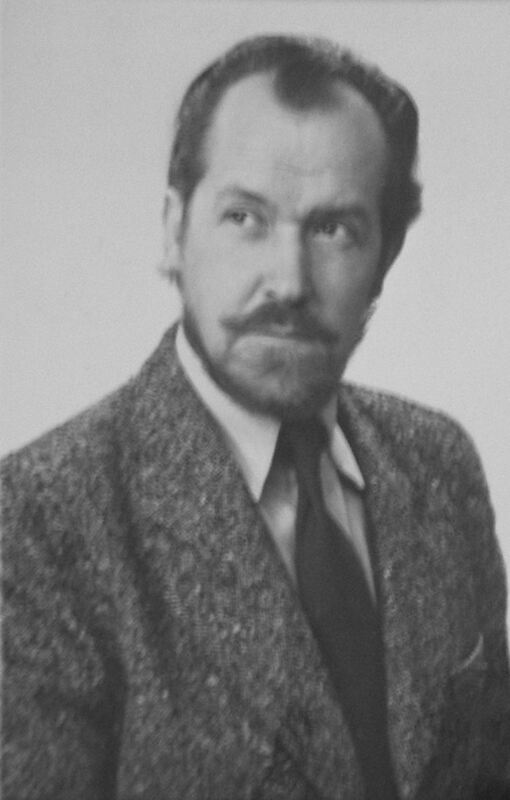 Erik, Peter’s second son, taught school in Copenhagen for many years. Palle [link goes to his website] and his wife Pia live in northern Jutland and have five children. Mother, Magda Luise, was born in 1902. 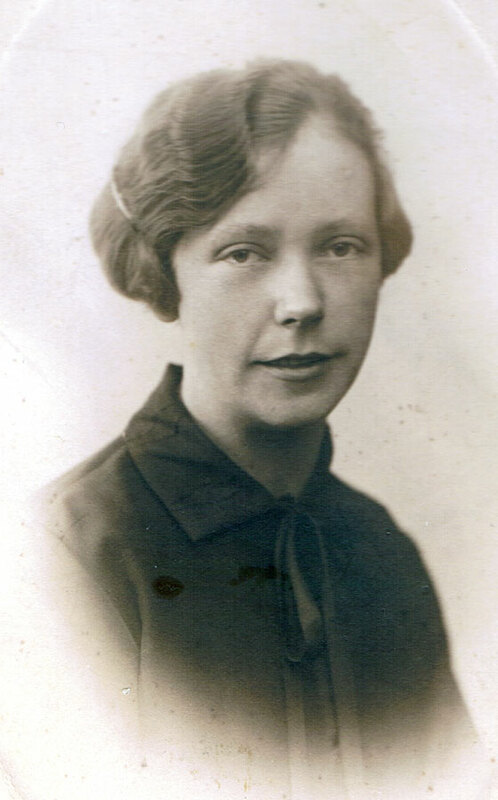 Lydia, (1904-97), was less than three years younger than Mother, and Mother, for some reason lost to memory, called her Lotte, so we called her Tante Lotte. She learned nursing in her youth and played the organ for the services in the Methodist chapel in Skive. During her training as a nurse she met a patient with a broken leg; he was Jakob Andersen, a farmer at Hald, near Skive, and upon completion of her training they were married. When Jakob died she moved to ‘De Gamles Hjem”, a senior citizens home in Skive. She apparently suffered from severe memory loss and perhaps Alzheimer’s disease during her last years. 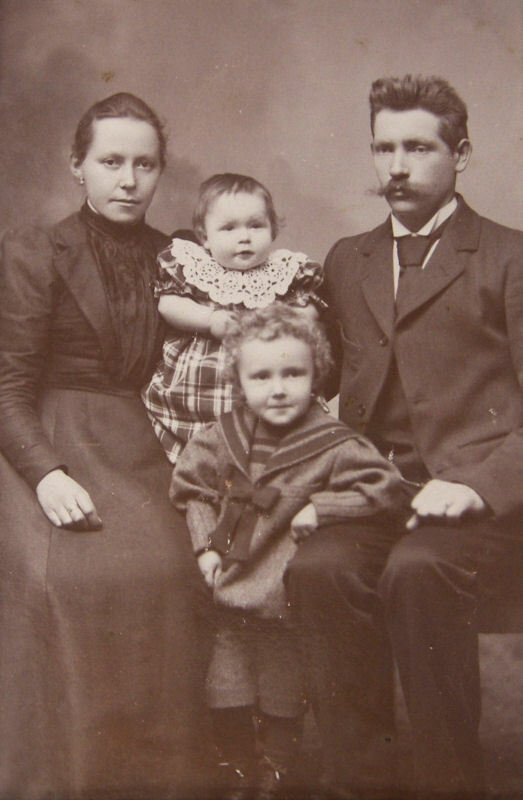 Lydia’s daughter Karen married a farmer, Alfred Kristensen; they lived on Lundøvej, near Skive. Lydia’s son Peter was a carpenter. At 43 he realized that he was losing his sanity, probably as a result of the glues he used in his trade. He then took his own life. 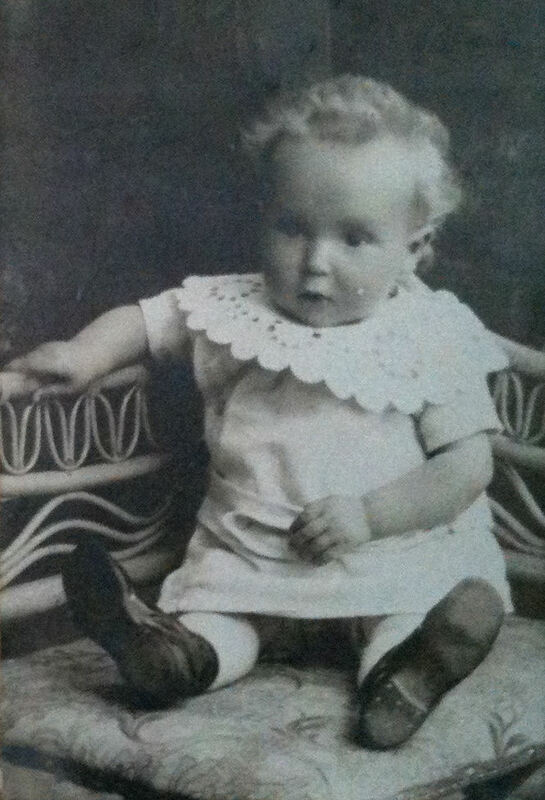 Next in the family was the boy, Aksel, who died of pneumonia at the age of six months. 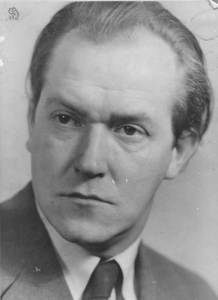 The fifth was also named Aksel (1909-84). He later changed the spelling to Axel. He too obtained free mellemskole education in Thisted. He served an apprenticeship as a woodcarver while in his teens, and found employment in Malmö, Sweden. Later he became proficient in other forms of art. Upon completing his apprenticeship he wanted to join us in Nova Scotia and actually crossed the Atlantic and landed in Jamaica; however he developed appendicitis and had to return to Europe. He had his appendix removed in Holland, and Peter fetched him home. He married rather late in life, and he and his wife Margit, a Swedish artist, made their home in Stockholm; they had no children. 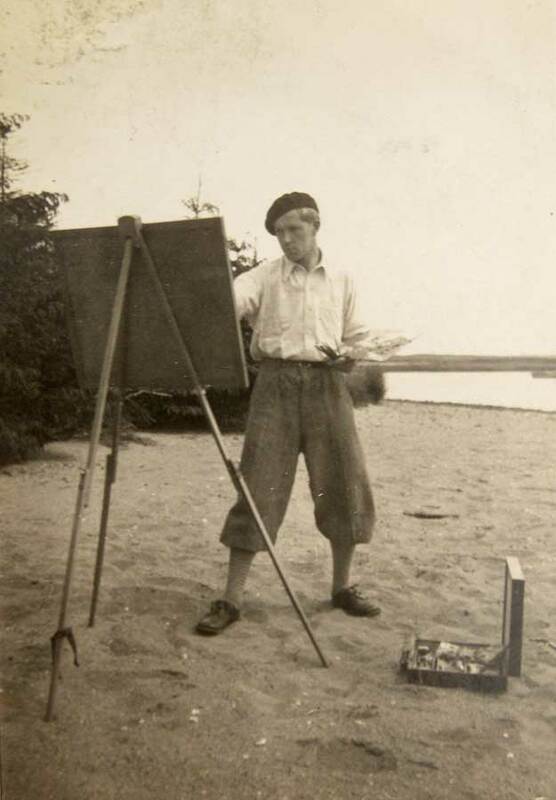 During his years in Malmö however Axel fathered a daughter who after his death helped Margit in arranging exhibitions of her father’s paintings. Both Axel and Margit made their living by their art. Axel had a drinking problem. Johannes, or John, was born in 1912, came to Canada with his parents in 1929 and worked on farms in Pictou County. On his return to Denmark in 1934 he became a barber. He was also interested in repairing clocks. He died of meningitis and lockjaw at the age of thirty-five. He was married in Denmark but left no descendants. 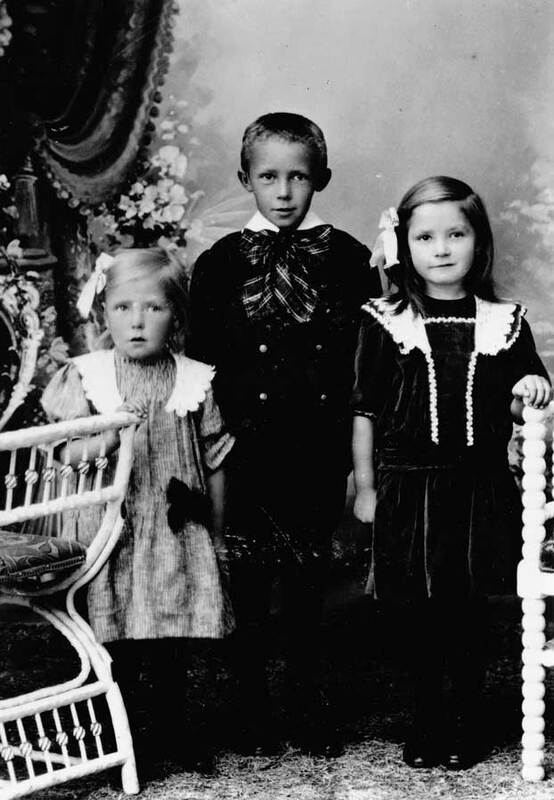 Ester [d. 2007] was born in 1915, came to Canada with her parents in 1929 and returned to Denmark with them in 1933. She went to school in Canada for part of a year. She has been married four times. 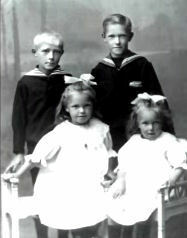 With her first husband, Julius Hansen, she had three children, Ase, Jørn and Dorte. With her second husband, Ewald Moller, she had one son, John. In 1960 Ester came back to Nova Scotia and married Karl Mogensen, Dad’s cousin; he had apparently been quietly carrying a torch for her for many years. They lived at Caribou in Pictou County until Karl died in 1983. In 1990 she married Filip Johansen, a Norwegian who had come to Canada in 1926. She went to live with him in Ailsa Craig, Ontario where he died 15 months later at the age of 87. 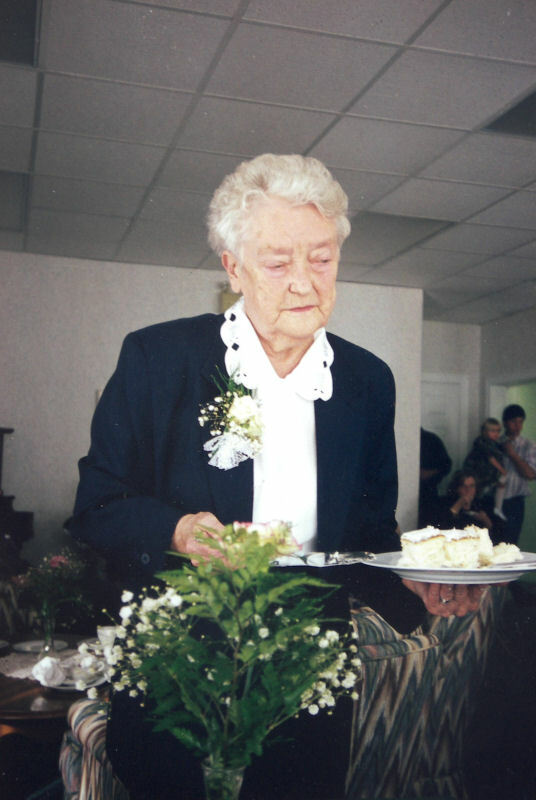 She moved back to Pictou county and died in 2007. She had memory problems in her last years. 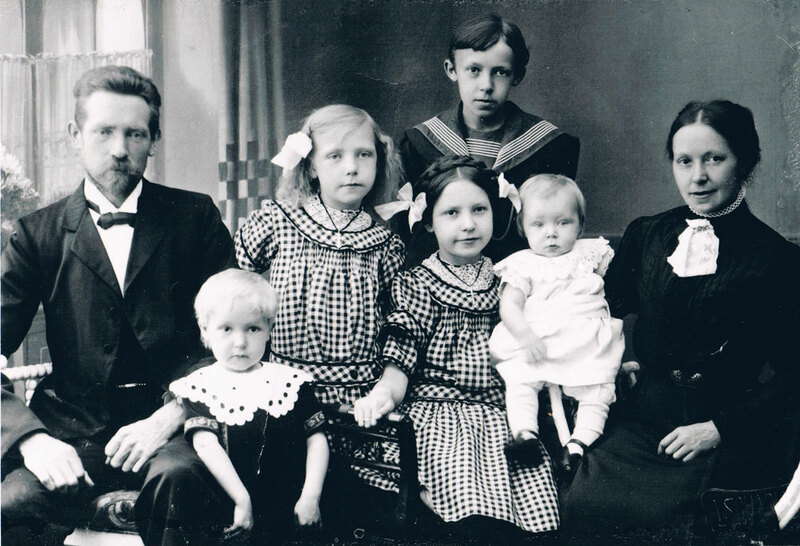 Åse had six children. She died in 2011. Dorte (Edward MacMaster) lives in the Pictou area; Dorte had a small business in Pictou and is a good singer; she has three children. Jørn is in London, Ontario, and has three sons. John is dead; his son survives. Emilie, or Mille [d. 2011], was born in 1917. She too returned to Denmark with her parents in 1933. She married Carl Lindblad, a construction worker, and in 1950 emigrated to Canada with him and their three sons (a fourth was born in Canada). Carl worked in New Glasgow for a time. Then they bought a farm at Marshville, near River John and were there until a heart attack forced Carl to give up farming. They moved to Montreal where he became caretaker of St. Andrews-Wesley United Church. In 1987 he was incapacitated by a stroke and in 1991 he died. Mille lived in a seniors’ complex near New Glasgow until her death in 2011. Unlike her sisters, her mind was sharp until the end. Karl Kristian [d. 19–], Mille’s oldest son; lived in Montreal and was a computer consultant. He had three children. Flemming is a graduate of Mount Allison University. He and his wife Gillian live in Ajax, Ontario, where he has been a personnel officer and trainer with Rio Algom, and Gill teaches school; they have three sons. Hasse’s wife’s name is Susan and they lived in Lismore, Pictou County, and now in New Glasgow; they have two sons. Hasse has had a varied career as a police officer, fisherman, union executive and provincial political candidate (NDP – Pictou East). Erik and Michelle live in Duncan, B.C. 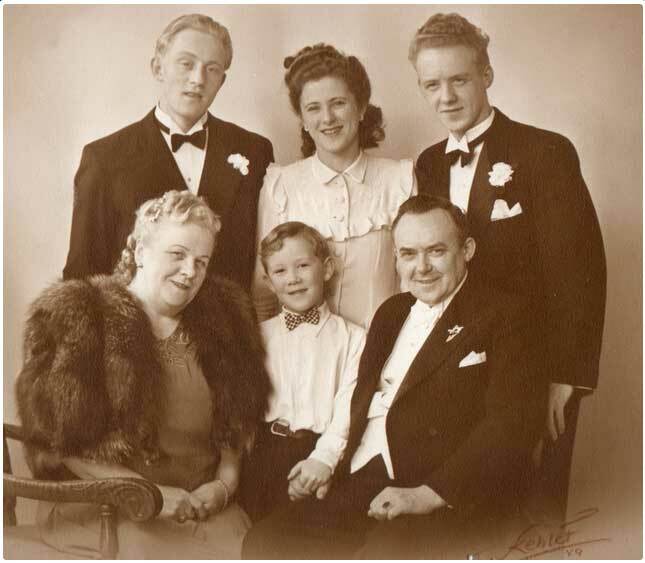 Mille, Carl and their 3 sons leaving Denmark 1953. Her father is in the background. Ester with her 4th husband, Filip Johansen. It was a very sweet love match.